The world famous Tandoori Chicken was invented to fulfil the dying wish of Kundan Lal — the ageing owner of the legendary Delhi restaurant Moti Mahal. The young man who would take over from Kundan Lal accomplished that feat. Tandoors were used only for rotis and naans in pre-Independence era. The young man not only grilled the meat in the Tandoor, but also marinated the meat, making it tender for the old man. 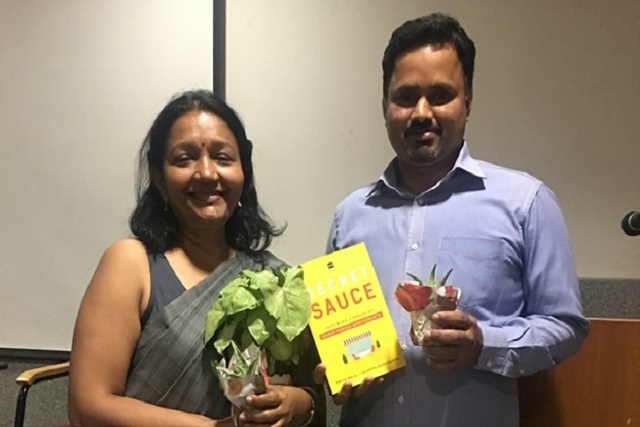 Priya Bala and Jayanth Narayanan’s are narrating these and similar stories behind the legacy of famous eateries in their latest book Secret Sauce. Addressing students on campus, the authors offered tips on the process behind writing such a book. This helped the students understand the nitty-gritty of writing a book. Secret Sauce covers a range of restaurants from the Hole in the Wall, Nizam’s Kathi Rolls in Calcutta to international chains like Subway and Domino’s, who have scaled up massively in the country. The USP of the book is the story or the ‘hidden factor’ behind the success of 40 well-established businesses.